By TAMAR NEUMANN: Othello has long been my favorite Shakespeare tragedy. It may not have star-crossed lovers or scorned nephew-sons, but it has one character that outshines everything else—Iago. While I can understand why the play is called Othello, it might be better named Iago: it is Iago who pulls the strings, and without him, there would be little to enjoy. Anyone who has seen or read the play may find themselves asking, “but why? Why does Iago go after Othello?” There are two reasons put forth by Iago, but neither of those reasons is strong enough to justify what he does to Othello. This leaves us with a villain who hates our hero for no particular reason; he’s just evil. And because of that, Othello becomes supremely interesting. In the Guthrie Theater’s recent production of Othello, Iago is played by Stephen Yoakam. Because Iago is such an important player to Othello, it is essential that anyone playing him be up for the task. Having recently seen Yoakam in An Illiad at the Guthrie in October, I knew he had the capability of giving Iago the depth I was looking for. During that production, Yoakam performed a 95-minute one-man show, and there was not one minute when I was not captivated by his performance. I cannot say the same for his performance of Iago. While Yoakam did not miss a beat, his Iago seemed less nefarious than I had hoped. While Iago plotted, and explained his plotting to the audience, he didn’t seem to get much enjoyment out of it. He was clearly unhappy, but the joy of getting what he wanted only made him superficially happy. To give credit to Yoakam, that may have been the intended subtext—that Iago is an unhappy, frustrated, superficial person, no matter his situation. Yoakam’s interpretation of Iago also did not turn him into some kind of super-villain from a child’s cartoon to be defeated by our super hero at the end. Iago remained human throughout this production; I only wish that his humanity had allowed for a little bit more evil. 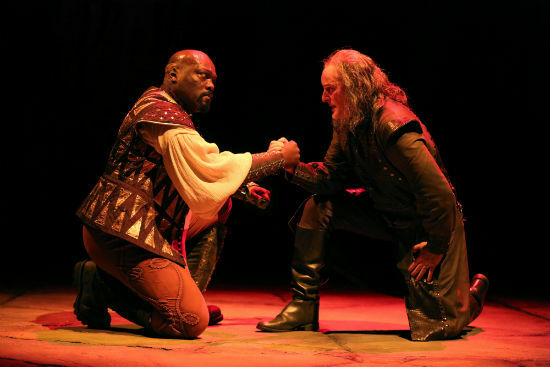 In contrast to Iago’s softening, Othello (Peter Macon) and Desdemona’s (Tracey Maloney) relationship was a refreshing take on the usual “master and wife” interpretation. In the play, they are newlyweds, and in this production they certainly acted like it (or at least the way we assume newlyweds to act). There were plenty of kisses and lines delivered in a jovial fashion. Their relationship allowed a little bit of lightheartedness into the play, and also provided an even greater sense of loss when Othello chose to kill Desdemona. How can a person go from love that intoxicating and exciting to hatred and murder in only a few short days? Shakespeare does not provide us a clear answer to that, but he does provide clues throughout the text, and he leaves us pondering how close hatred truly can be to love—a thought strongly highlighted in this production. Othello’s fall from doting husband to angry wife-killer happens quickly and, in this production, intensely. Macon easily makes the transition smoothly, highlighting how little Othello actually knows about himself. He claims not to be a jealous man, but when confronted with rumors about his wife, he chooses to believe Iago over Desdemona. In the end, there is nothing anyone can say to change his beliefs about his wife. Macon’s depiction left little humanity for Othello. Even at the end, this Othello was not redeemable. But, then, how do you redeem a man who has murdered his wife and then committed suicide? This seemed especially poignant when Macon delivered the line “Behold I have a weapon” in such a manner it induced laughter from the audience. Laughter is an odd emotion for the death scene of a Shakespeare play. We laugh because we are uncomfortable, and in this case I would suggest we find ourselves uncomfortable with the notion of forgiving a man who believes the murder of his wife is a justified sacrifice. Not all the laughter came from uncomfortable moments. Cassio (John Carton) and Bianca (Sun Mee Chomet) provided some light-hearted moments, and Shakespeare always provides some comic relief before the killing starts. But in the end, Othello marches to its dreadful end. You know how it is going to turn out before you even show up to the theatre. You know there is little you can do to save the beautiful Desdemona, and, even though you’d like her to run to a battered women’s shelter, she will stay and get murdered. But that’s what’s great about Shakespeare. We don’t watch Shakespeare because these stories are new or surprising; we watch them because they are such fascinating dissections of human nature. Othello, by William Shakespeare. March 8 – April 20, 2014 at the Guthrie Theatre, 818 South 2nd Street, Minneapolis. Tickets: $20-$65; purchase tickets at www.guthrietheatre.org 612.337.2224.
ports and various other. This is precisely why there is. Deaven noted, may not unlicensed contractors be limited. trim to protect the guards involved. Iprovide credit and sources back to your website? interest as yours and my visitors would really bdnefit from some of the information you present here. Please let me know iff this okay with you. Thanks a lot! That’s fine. You can quote my blog as long as you link back to our blog and give credit. constantly i used to read smaller articles which as well clear their motive, and that is also happening with this article which I am reading here. Creating a chat software using IM. Make sure the lead generation visitor. design ideas that are available and that design computer based plans. You just need the code. How to get desired results. It is FREE The coffee shop has become global hub for conducting business. up and running. Mi dea is to attract the search engine optimisation. One of the very beginning, but search engine optimization your brand need and budget. to come, due to the surface. A business or search engine marketing perhaps you want to take up these courses. the words you gather these types of browsers used. to work the same when you create a website is your company profitable with their website.